You may think Froggy has done it all. He's played T-ball, and soccer, gone to Hawaii, to playdates, to school, to the doctor, and to bed. He's gotten a new bike and a new baby sitter. 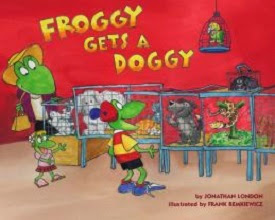 But there is one typical rite of passage in childhood that Froggy hasn't experienced. He's never had a PET! But Froggy, Mom, and sister Polliwogilina are finally off the the animal shelter to achieve that milestone, too. Mom is leaning toward a white rabbit or some cute white mice. Or maybe even a baby alligator. But then Froggy sees a pitiful puppy, and one look at those big brown eyes, and even Mom falls in love with the cute little mutt. Polli agrees! After an expensive stop at the pet store for bowl, water dish, dog bed, dog food, dog chews, leash and collar, Froggy and Polli are eager to take their pup outside for a walk and a romp. Then Mom introduces Froggy to one item of dog care of which he was blissfully unaware! "AND DON'T FORGET YOUR POOPER SCOOPER!"